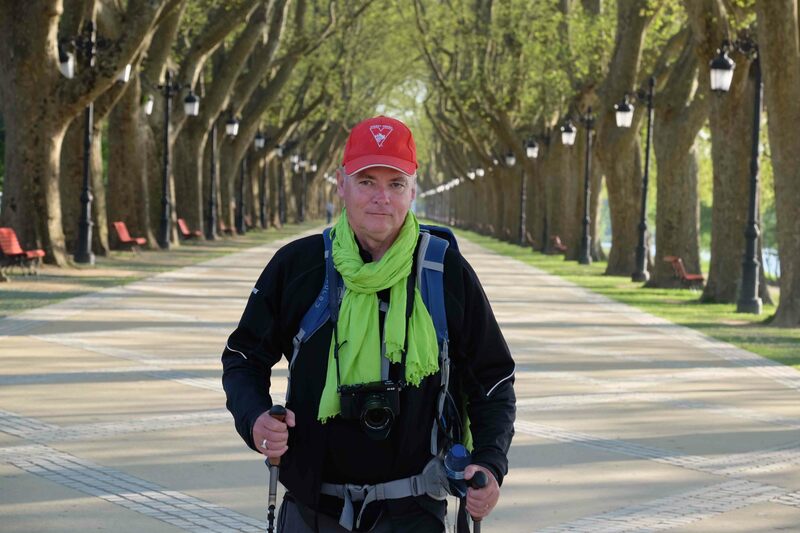 The book I’m currently writing, Photo Camino, is principally a guide to taking photos on the Camino. However I am peppering it with a few anecdotes. I then watch like a hawk as they take the shot, and I know immediately that it’s not going to be any good. They proudly hand me back the camera, kind of like TAH-DAH! and wait for me to check it and tell them what a great shot they took. So I check it, and of course the shot is completely unacceptable. I show it to them and explain patiently where they got it wrong – mainly framing and headroom issues, but sometimes they’ve got the focus wrong too. And then I ask them to do it again, which stretches the newly acquired friendship somewhat. So begrudgingly they take the shot again, and again I check it. And again it’s not right. So once again I tell them what’s wrong, and how they can do it better – ignoring their growing sense of enmity towards me, as if it’s MY fault that we have to go through this charade. So they take another shot – and it’s better but not perfect – and then we take another – and by now I can feel their barely suppressed rage radiating out towards me like heat from a wood-fired stove – and being a pilgrim, I forgive them. Often it’s focus. They somehow or other get the automatic focus wrong, which to me is incomprehensible, so I put the camera on manual focus and pre-focus for them. I make sure the exposure settings are correct, remind them of the framing and stress NOT TOO MUCH HEADROOM, and then finally when I’m sure that they can’t possible get anything wrong, I allow them to take the shot. I ask to check it once again, and for a moment I get the feeling they’re about to hurl the camera into my face. But they hand me the camera, their agitation now undisguised, as if they had some place better they needed to be. Ingrid, you’re amazing. You are always the first person to like a post – and usually it’s pretty much straight after I’ve posted it. THANK YOU!!! I rmember your posts from the Portuguese… it was always Jennifers fault…especially the ones about ‘headroom’. lol… how can you possibly expect perfection from someone who does not have a keen eye as yourself, knowledge and expertise…. and then again, myself, I love snap shots, the unexpected kind. They can be wonderful, not perfect, but wonderful because they capture life as it happens, not as it is rehearsed. And yet, I would not roll my eyes at you and patiently repeat the photo over and over again, because… they would be for your camera and not for mine. However, I am always open for learning new things. I think “Headroom” should be your new nickname Bill. I recall very fondly the first time Donna and I met you and Jen at a Turkish restaurant in Brisbane’s, Southbank Parklands. The poor waitress had to take our photo 5 times before you got one that you were half happy with! Lucky it was after the food had been served or I reckon your would have ended up with your meal in your face! Can’t wait to read the book Bill. I’m sure it will have a good amount of humor as well as covering all the practical aspects of photography on the Camino! Perfect amount of headroom in the photo above I think Bill? The photographer must have got lucky! Haha -yes, poor lady. That was. A lovely afternoon though . And who would have thought we’d end up such friends! Bit too much HR Greg! Tut tut!!!! I hate to get all serious on you Headroom but can I ask specifically about the headroom in this photo. I can see what you mean there is a little bit too much. But…how do you improve it? With this particular photo I imagine the background is just as important. If you angled the camera down so there was less headroom there would be too much unnecessary clutter at the bottom. Do you look first at framing the background? And in this case perhaps there needs to be a little less at the bottom and more at the top? And then do you consider the placement of the subject? Which with this particular background I imagine it would be difficult to get the right aspect as you aren’t ten foot tall. But Donna, to answer your question. I gave a lot of thought to this cropping – because I could have cropped the shot in editing to bring the headroom down to what it should be, which is cutting across just above the top of my cap. But if I did that, then I would have lost most of the green vegetation above my head – and most importantly I would have diminished that recurring image of the white light fixtures. So it was a deliberate choice to leave that shot that way, to make more of the wonderful symmetry of the shot – but also the whole tone would have changed if I’d cropped down to regular headroom. It would have gone from a “leafy” shot to a more sombre darker shot, with the trunks of the trees more predominate. As for your question about pre-framing – yes I will do that when the background has a particular feature which requires you to frame it a particular way. And then you either place your foreground subject in shot where you want it, or you wait for the foreground to come into shot, and you then release the shutter at exactly the moment when the composition is correct. You have to be careful when you do this though that you have pre-focused for foreground and not for the background, where you have pre-framed. In pre-framing for the background, you most probably also pre-focused for that. But if you want to feature foreground subject matter against that particular background, and you’re waiting for that subject to come into frame, then you have to pre-focus at the point at which you expect that subject will land. I hope that’s not too technical. The book will be way way simpler than that!! Sorry for the delay in replying. I’ve been on the road to Tannum. Thanks for your response. Not too technical at all. I understand everything you are saying just not sure with this particular photo how, if it were me taking it, I could improve on it. Hi Donna – the only way it might be improved is to go longer on the focal length, and stand back further. But as it is the shot works really well. The receding lights bring the viewers eye to the head of (me) and so it’s very nicely framed. Was it Greg took that shot??? I think a ‘Frozen’ moment happens here…. ‘let it go’ and breathe. The photos are perfect to me. I was going to make a comment but Greg beat me to it. There’s a tradition on American long-distance trails to use a trail name instead of one’s given name. You can’t pick your own trail name – it has to be given to you by someone else. From this day forward, you will be know in the hiking/trekking/camino community as “Headroom,” not to be confused with Max Headroom from the 1980’s. Looking back at the photo from our lunch at the Versailles Restaurant, there is proof that you sometimes accept photos that do not meet your usual standards. I am honored to be included in one. That’s funny Michael. then I guess I should be called Min Headroom, not Max Headroom (Min being minimum… ) haha!! That picture brings back one of my favorite memories of the Camino Portuguese. It was a beautiful scene ending a nice day. I think the framing is perfect, including the headroom. In my layman’s perspective, I think headroom, per se, applies more to shots of people where the background is not significant. In this picture, the background is everything. I don’t remember where we were walking into, but I definitely remember walking into it. The name is much less important than the image and feeling in my mind.